SIERRA VISTA, Arizona - It always comes back to illegal immigration in Arizona  even when the state is on fire. U.S. Sen. John McCain on Monday defended a statement he made over the weekend that there was "substantial evidence" border crossers were partly responsible for wildfires in the state. Two other Arizona Republicans stood with him. But activists swiftly jumped on McCain's statement as "scapegoating." Authorities say the three major blazes in Arizona were started by humans, but they don't know any more details. The debate raged as authorities went through neighborhoods Monday to examine damage from a wildfire that burned into a heavily-populated area near the U.S.-Mexico border. 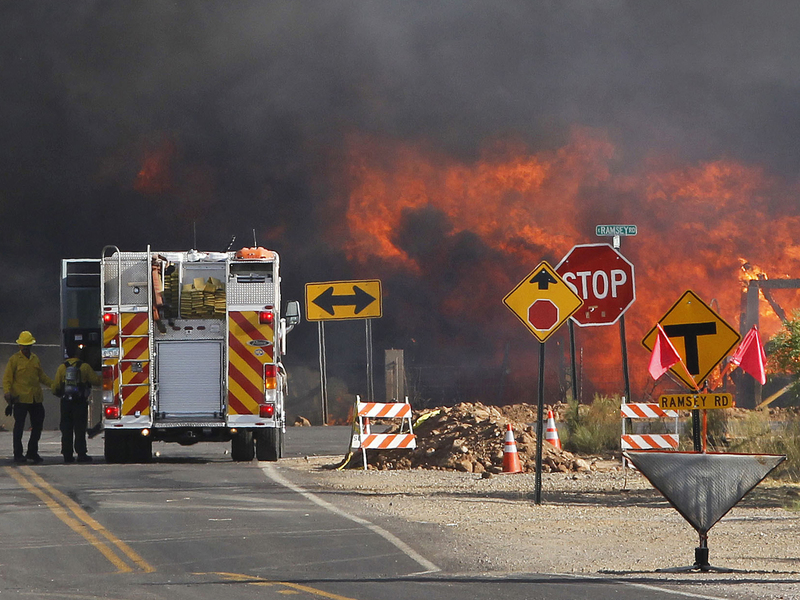 About 10,000 people remained evacuated on the outskirts of Sierra Vista about 15 miles north of the border where the so-called Monument fire swept off a mountain and destroyed 14 homes and four businesses Sunday. The blaze was about 27 percent contained as of Monday. The fire has now destroyed 58 homes and burned more than 40 square miles since it started about a week ago. Along the border with New Mexico, the biggest blaze in state history has charred an area five times that size, but hasn't done as much damage. Despite burning more than 800 square miles since late May, the Wallow fire has destroyed just 32 homes and four rental cabins. Containment rose to 56 percent late Monday. As for the third major fire in Arizona, the blaze in the far southeastern part of was 80 percent contained after charring more than 330 square miles since it started May 8. The Horseshoe Two fire has destroyed 23 structures. Officials say all three blazes are the result of human activity. Whether illegal immigrants were involved  as has sometimes been the case  is unknown. The issue heated up over the weekend when McCain told media: "There is substantial evidence that some of these fires have been caused by people who have crossed our border illegally. The answer to that part of the problem is to get a secure border." The statement brought a quick reaction from activists. "It's his constant refrain for everything that ails mankind," said Roberto Reveles, the founding president and a current member of Somos America, an Arizona-based immigrant rights group. "It just seems like we have an epidemic of 'blame it all on the illegal aliens, blame it all on the Mexicans.' It's amazing that the public doesn't rebel against this type of scapegoating." McCain and fellow Arizona Republicans Sen. Jon Kyl and Rep. Paul Gosar released a joint statement Monday defending McCain, saying that they had been told that some fires in the southern part of the state are started by illegal immigrants. They did not specify to which fires they were referring but framed the debate as a distraction. U.S. Rep. Raul Grijalva, an Arizona Democrat, disagreed with that depiction. "They served this, they pandered it, and now (they) say that anybody who criticizes that inappropriate, unsubstantiated claim somehow has a political agenda. This is a tragedy of huge proportions for Arizona. Those of us who criticize it are only reacting to what they started." On the fire lines in Sierra Vista, neighborhoods that had been shrouded in a massive plume of black smoke a day earlier were free of it Monday, and the towering mountain that fed the flames was smoldering. Those forced from their homes waited to be escorted back in. James Hernandez, a retired graphic artist who lives in Hereford, rushed back from vacation in California on Saturday when he heard that the fire had worsened and had jumped the four-lane Highway 92. "The flames went over that," Hernandez said, noting that wildfires are a part of summer life in southern Arizona and normally aren't cause for concern. "They have never done that before." As for the Monument blaze, authorities kept about 200 residents of Luna, New Mexico, under an evacuation order for a third day on Monday. And one of the last areas still evacuated near that fire in Arizona reopened Monday as residents of the resort town of Greer began to return home. And authorities reported a new wildfire in north-central Arizona that officials said could threaten power lines running to Phoenix as well as some scattered ranches in coming days. In Texas, firefighters working to contain a massive wildfire in East Texas expected unusually hot and windy weather Monday, a day after several blazes broke out across the state and destroyed more than three dozen homes. About 1,800 homes and businesses were evacuated. Smaller fires were reported in central California; north of Santa Fe, New Mexico, and on both sides of the New Mexico-Colorado Border.